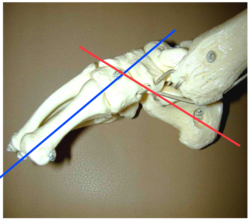 The medial and lateral collateral ligaments provide valgus and varus stability, and allow for rotation. 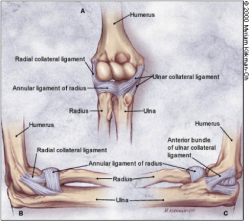 The annular ligament encircles the head of the radius, stabilizing it in the radial notch. Each of these ligaments can be injured by elbow trauma or overuse. Although ligamentous injuries are rare, patients may present with varus or valgus laxity due to overuse or trauma. Lateral Collateral Ligament injury is often associated with trauma and forceful motion into varus. 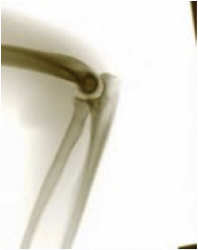 These injuries are commonly associated with a fracture or subluxation at the elbow joint. An Ulnar Collateral Ligament tear or sprain could occur with valgus overload or stress movement from pitching or throwing. Typically seen in younger male pitchers, a UCL tear or sprain could also be found in athletes involved in repetitive overhead activities like tennis or volleyball. Another common name for UCL tear is Little League Elbow Syndrome. Varus Stress Test, tests for laxity of the Lateral Collateral Ligament (LCL). Valgus Stress Test, tests for laxity of the Ulnar Collateral Ligament (UCL). Moving Valgus Stress Test, tests for chronic UCL sprain or tear from overuse (sensitivity: 100, specificity: 0.75). Modified Milking Maneuver, tests for UCL sprain or tear from overuse. Palpation, in order to manually exam the integrity of the ligaments. The DASH is 30 questions scored from 0-100, 0 meaning no disability. The DASH is well studied and validated with a minimally clinical important difference or MCID of 15 point or MCD of 12.7 points. The Quick DASH, commonly used in place of The DASH. The patient chooses the response that is the most true from 1-5 for each question. The scoring instructions are listed on the bottom of the form, however The Quick DASH has no known MCID unlike the DASH. The Patient Specific Functional Scale is a scale where the patient chooses 5 activities that are difficult to perform and rates those tasks from 0-10, 0 being not able and 10 being able. The MCID for the average of the 5 activities is 2, while for 1 activity the MCID is 3. Due to lack of high quality literature for these conditions, it is recommended that an impairment-based approach be used to guide management. Nonsteroidal anti-inflammatory drugs (NSAIDs) are commonly used for relief of pain and inflammation. If pain is severe, a mild narcotic or corticosteroid injections may be prescribed. Common impairments to assess in examination could include decreased elbow or shoulder range of motion, joint effusion, and decreased strength of the upper extremity musculature. It is recommended that individuals with these conditions remain active, while protecting the ligament from stress. Activities that aggravate the symptoms should initially be minimized in order to allow for ligamentous healing. Activity level can thereafter be increased gradually. Pain and swelling may be relieved through the intermittent application of ice during the acute stages. Surgery for the UCL is indicated in complete tears and for athletes wanting to resume previous level of activity. The most common surgical procedure, Tommy John surgery, is when the UCL is replaced with a tendon from elsewhere in the body (often from forearm, hamstring, knee or foot of the same patient). This procedure is most common with athletes from several sports, most notably baseball. Surgery to repair the LCL alone is rare and is typically associated with a fracture, dislocation, or subluxation of the elbow. Due to the decreased structural stability of the joint and ORIF may be considered at the discretion of the surgeon. Dislocation: Exaggerated boney prominence, effusion, or appearance of elongation of forearm and could affect neurovascular status. Josefsson PO, Gentz CF, Johnell O, Wendeberg B. Surgical versus non-surgical treatment of ligamentous injuries following dislocation of the elbow joint. A prospective randomized study. J Bone Joint Surg Am. 1987 Apr;69(4):605-8. Muller MS, Drakos MC, Feeley B, Barnes R, Warren RF. Nonoperative Management of Complete Lateral Elbow Ligamentous Disruption in an NFL Player: A Case Report. HSS J. 2010 Feb;6(1):19-25. Yang C, Li W, Gong YB, Li SQ, Qi X. Posterolateral rotatory instability of the elbow: a case report and literature review. Chin J Traumatol. 2010 Dec;13(6):380-2. 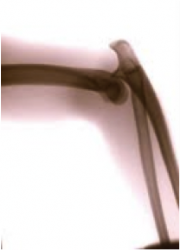 ↑ Chumbley E. O'Connor F, Nirschl R. Evaluation of Overuse Elbow Injuries. American Family Physician. Feb 2000. Available at http://www.aafp.org/afp/20000201/691.html. Accessed March 2010.